There may be no place better than Connecticut to discover nature. This blog tells of discoveries about geology, paleontology, ecology and fisheries made in the state over the past two centuries and connects them with events occurring around the globe today. The U.S. 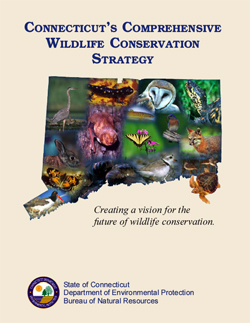 Fish and Wildlife Service granted approval to Connecticut's new Comprehensive Wildlife Conservation Strategy in January 2006. "The intent is to provide guidance and vision for wildlife conservation in Connecticut," the document states. "Accordingly, the strategy: Addresses the broad array of all fish, mammals, birds, reptiles, amphibians and invertebrate species; Uses available funding to address the species in greatest need of conservation and their habitats; Identifies actions needed to conserve species diversity and keep common species common; Builds upon past efforts to conserve all species of wildlife; Encourages the creation of partnerships with conservation organizations at local, state and regional levels to enhance opportunities for implementation of actions to conserve wildlife." Its worth a read. The strategy represents a fundamental yet critical opportunity for government, communities and individuals to collaborate on protecting local biodiversity and habitats. Given the limitations of "available funding," this effort will need the support the public and people's participation to succeed. I found a small nest with nothing but a round ball of dirt in it. what is this. Eco: Has the canary keeled over?